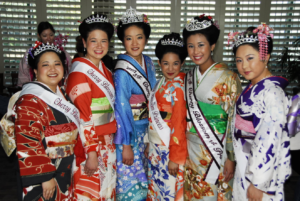 The Queen Program is proud to display all of the beautiful kimono donations the Northern California Cherry Blossom Festival has received over the years. 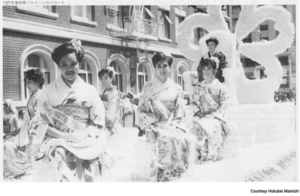 The Kimono Project began in 2009 as an effort to archive the pictorial history of the gifts bestowed upon the Japanese American community of Northern California through the Cherry Blossom Festival and Queen Program. 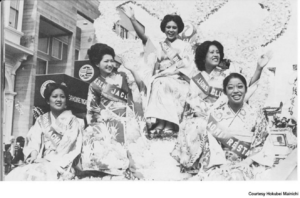 The Queen Committee is always looking for photos to add to our collection. 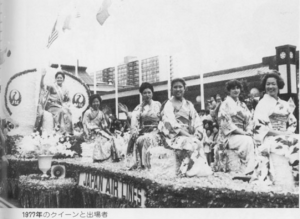 If you have photographs you would like to contribute, please fill our photo submission form. 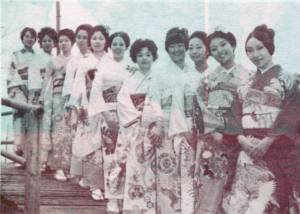 In 1974, the Shintaku Kimiko Sogogakuin was establish in Osaka as part of the Kyoto Kimono Gakuiin. 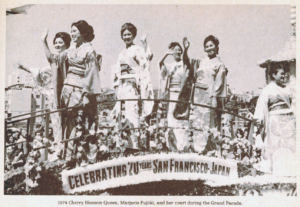 Madame Shintaku wanted to make a donation to the Northern California Cherry Blossom Festival and in 1997, she gifted the Queen Program with several of her original kimono designs. 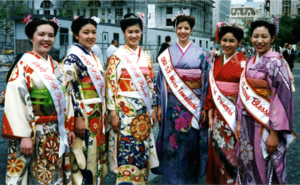 In 1998, she then donated a full set of elegant rose-colored kimonos, and to commemorate the millennium, a striking set of gold kimonos were sent along with several other exquisite designs. 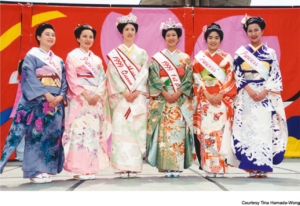 Each year, members of the court wear these beautiful kimonos for the Cherry Blossom festivities. 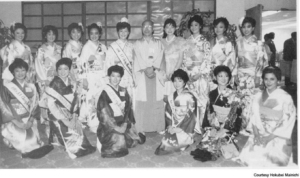 Most of the Queen Program’s kimonos were donated by Mr. Seishichi Ato and his successor, Mr. Kazunari Mochizuki of the Fujiyasu Kimono Company. 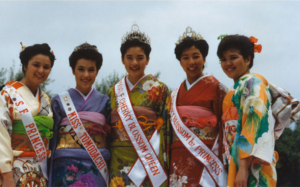 Since 1973, the Northern California Cherry Blossom Queen has been gifted a beautiful furisode donated by the Fujiyasu Kimono Company. 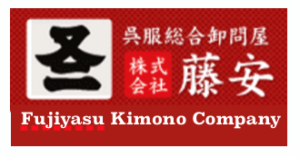 Click here to read more about this story. 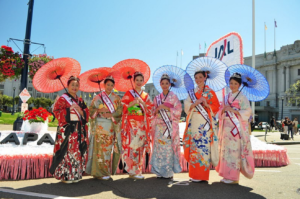 The below photo gallery contains images of the Queen’s furisode kimono. 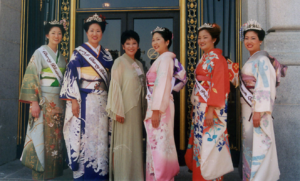 The below gallery contains images of the Northern California Cherry Blossom Festival’s kimono collection, worn by the Cherry Blossom Court.